The Olympics is different; special. It brings together the greatest collection of cultures, customs, socio-political views and environments, economies and individuals in any single event. And, we also already know that that diversity of Olympic competitors manifests itself via national strangleholds on individual events and particular event categories – USA in track and field (Analyzing Track and Field at the Olympics with data visualization), Australia in swimming (Analyzing Swimming at the Summer Games with data visualization), Russia and the Soviet Union in Gymnastics (Analyzing Gymnastics at the Summer Games with data visualization). So does the variety in the socio-political ideals and economic capacities of countries competing at the Olympics also affect their pedigree in team and individual events or event categories? That is, are certain nations more inclined to perform well in team, rather than individual, events (or vice versa) because of their social, political and economic values, mentalities and background? Well, for starters, it’s worth noting that at each modern Summer Games, there have been between two and three times as many individual events compared to team events. So logically, more nations will have won medals in individual events by virtue of the historical Olympic program of events. Countries that have won a greater proportion of their total medals via individual events will have a lower medal to medalist ratio than countries that have secured a larger percentage of their medals from team events. So which countries have won a higher fraction of their medals from team events at the Olympics? And what are the potential reasons for this outcome? Note: Whilst each participant in a medal-winning team receives a personal medal, the team’s medal-winning performance only counts as one towards their country’s total medal tally. Notwithstanding the aforementioned event imbalance (individual vs team), the Yugoslav Federation sits atop our medal ratio table, with the highest medal to medalist ratio of 1:4. The result suggests that the Yugoslav Federation has won a higher proportion of its medals from team events than any other country, and that it is the most team-oriented nation over the duration of Olympic competition – that is if success is representative of dedication. Note: We understand that it is conceivable that a nation might have a number of high achieving individual athletes who might win multiple events, thus resulting in a higher medal to medalists ratio – a result that we previously indicated should denote countries that have won a relatively high proportion of medals from team events. To minimize the potential for standout individual athletes competing in individual events to skew results, we have only graphed countries in the above chart with a minimum of 100 medal-winning athletes. For example, former Zimbabwean swim star, Kirsty Coventry, has won seven of Zimbabwe’s eight Summer Olympic medals across seven individual events. Conversely, the USA sits near the bottom of the table, with a low medal to medalist ratio of almost 1:1 (1:1.3). The USA has won a total of 2,313 medals at the Summer Olympics, spread across 2,992 medalists. So what national factors relating to each respective nation underpin, or contribute towards, this outcome? Are they political, social, economic or ideological? It’s tempting to suggest that the individualistic mindset often associated with the USA could be a causative factor. If so, is this a case of differing socio-political ideologies, where self-oriented consumerism promotes individual excellence over a historically socialist mentality geared towards community (team) prosperity? Or perhaps it’s simply a case of economic capacity, where the more affluent nations have the means to fund the success of individual Olympians and aren’t restricted to the cheaper per head option of supporting team sports? Or have countries like Brazil, Argentina and Spain only really medalled in a handful of particularly large team events (think soccer)? Interestingly, Japan and China sit next to each other on our table, with medal to medalist ratios of 1:1.36 and 1:1.34 respectively. Culturally and politically they would both argue that they’re vastly different. But perhaps their almost identical ratios can be explained by the fact that, in many respects, they’re both apt exponents of hyper capitalist economics. And, do Canadians, as a proportion of their total medals won, excel at team events in an attempt to distinguish themselves as markedly as possible from the ‘me, me, me’ mentality of their American neighbors? To definitively establish the globe’s most individual and team-oriented nations at the modern Summer Games (those who have won the most medals in individual or team events as a proportion of their overall medal tally), we’ve employed the use of one of Yellowfin’s new trellis charts. Note: As previously mentioned, there have been roughly three times as many individual events held throughout the modern Summer Olympics compared to team events. Therefore, to determine country orientation for team and individual events over time at the Summer Games, we’ve weighted team events by a factor of roughly three. We’ve then subtracted the weighted team medal count from the individual medal count. As a result, red squares with a negative value represent strong team results (more medals won in team events as a proportion of total medals won), while blue squares with a positive value represent strong individual results (more medals won in individual events as a proportion of total medals won). 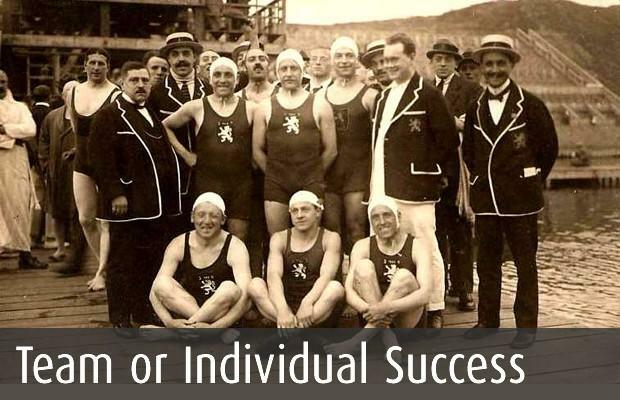 Individual or team dominated success: A revolving door? The first important feature that’s immediately obvious, is that many countries change between performing well in individual events to putting in strong displays in team events, and vice versa, over time. What environmental, time-bound, factors might attribute to this fluctuation? From the beginning of the modern Games in Athens, Germany’s medals were very evenly spread – with their relative proportions in mind – across individual and team events. Then, with the resumption of Olympic competition following their crushing defeat in World War II, they suddenly became extremely efficacious in team pursuits. Is this merely a coincidence, or a carefully coordinated attempt to construct a welcoming, non-threatening and cohesive international demeanor? And what about the USA? Up until the 1988 Seoul Games, America’s medal tally was dominated by glory in individual events. Then, the trend was suddenly reversed. Did the Soviet’s return to the Olympic arena, after their boycott of the 1984 Olympics in Los Angeles, somehow change the United States’ approach? Very few countries only perform consistently well at one end of the spectrum. The Soviet Union produced dependably prominent performances in individual events, which is counterintuitive to, and contradicts, our hypothesis that socialist countries would fair better in team events. Although, the Soviets did heavily rely on creating motivational propaganda in the form of ‘national heroes’, designed to inspire its people towards achieving goals of national importance. So perhaps this initially unexpected outcome was in fact shrewdly orchestrated by the USSR and is indeed reflective, not contradictory, of its socialist ideology. Inversely, Denmark and Norway have almost always excelled at team sports. Their high living standards and per capita GDP fly in the face of our theory that wealthier, more upwardly mobile, nations would have the capital to invest in more individual Olympic success. Although, maybe the neutrality of many Nordic nations lends itself towards a sense of community and, hence, multi-person accomplishment? Make sure you visit us again tomorrow as we wrap-up our series of Olympic data blogs ahead of Sunday’s Closing Ceremony (12 August).